My HTPC is made up of parts left over from my previous gaming machine and my previous HTPC. The video cards, Vision Tek Radeon HD4870 512MB versions, were just too darned LOUD for me to enjoy the system as an HTPC/Light gaming machine (I’m still playing Fallout 3 on it) so I decided to look around for ways to quiet them down some. I found the Scythe Musashi at CrazyPC for $39.99, so I thought I’d take a chance to see if I could save what’s left of my hearing while keeping the cards relatively cool. There are no instructions for installing this heatsink on the HD4870. The kit did not contain instructions, nor did the PDF file on the Scythe website. It’s straight forward enough though that you shouldn’t have a problem. 4 . I applied some Arctic Silver 5 to the GPU and installed the heatsink portion. The heatsink felt “loose” after installation, even after I tightened the bolts down all the way. I decided that I would have to use the copper spacer that came with the kit. Problem was, the spacer was as large as the whole GPU. I cut it down to size with a pair of Reds (metal cutters) and made sure the spacer was flat. I then removed the heatsink from the GPU and cleaned up the AS5, and put new AS5 on either side of the spacer, then slipped it in between the GPU and the heatsink and reinstalled it and tightened it down. It felt much more secure, though still a just a “little” loose. I was worried that the “looseness” would affect the temps or even cause damage to the card, but it didn’t. In fact, I was quite surprised at how well it performed! Within the installation kit could be found two Scythe fans, which could both be installed on one card (which I believe are Scythe Kaze Junior fans in 100mm*100mm*12mm in size). I used the fans on the the “bottom” one of the two video cards. The “top” Musashi-equipped video card was passively cooled. The case I use, the ABS Black Pearl, has two 120mm intake fans at the top of the case and I installed my case fans oriented so that they blew air into the case, right onto the top card’s heatsink. Because they were cooling the card so well already, I ran the “top” card without the fans that came with the kit. Ambient Room Temps were 71°F and Temps were measured using ATI Catalyst Control Center and GPU-Z to see if the temps matched up (they did). In the above 100% fan speed tests, noise level was 28.4dB at 1 meter. On the passive card, the temps were 3°C-4°C above the heatsink with active cooling. At stock speed, at idle, it’s .5°C – 1°C cooler and darned near 20dB quieter. There’s really no decision to be made here. The choice is a no-brainer. Get the Musashi! 1. Very thoroughly clean all the Ram Modules and other little chips that the OEM Heatsink touches, or the little heat sinks from the kit will NOT adhere properly. I actually very LIGHTLY sanded the RAM modules with 600grit to rough them up a bit. 2. Know that you’ll have to use one of the larger heat sinks for the two little voltage regulators as the kit does not ship with one designed strictly for them. There are more than enough extras though to make one work! 3. Using a pretty fair amount of pressure, hold each heatsink from the kit in place for about 1 minute, then move on to the next. Repeat until done. 1. Because the Scythe Musashi blows the heat into the case, rather than out the back of the case like the OEM, your case temps will rise a little bit. If you have good airflow in your case, this is not a problem. I saw a 1°C rise in my case. 2. Installing the cooler on the 4870 is N-O-T covered in the manual that comes with the kit, nor is it on the Scythe website. I downloaded the PDF manual and looked, and it isn’t in the PDF either. 3. 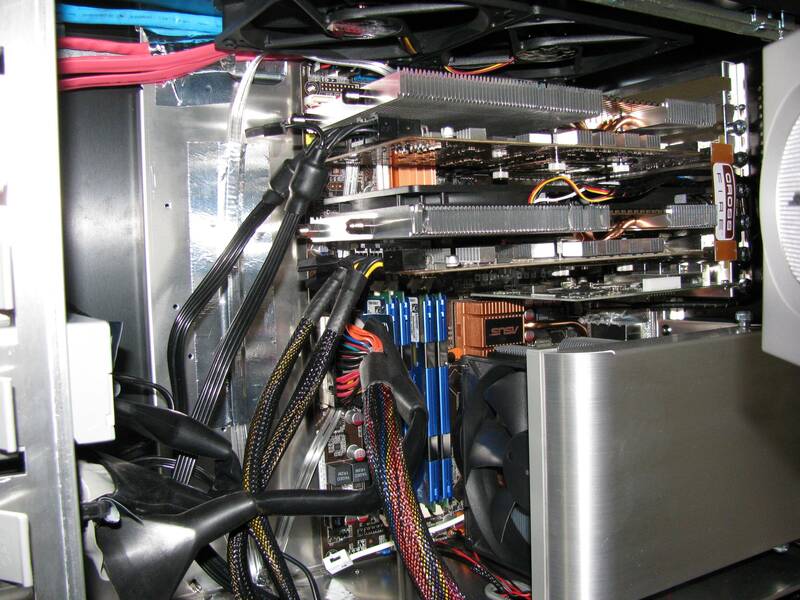 Installing on the HD4870 required the use of the copper spacer that shipped with the kit. If you do not use it, the heatsink will feel “loose” on the card, even if you tighten the screws all the way. I used metal cutters (Reds, as they’re commonly called) to cut the spacer to size. This review originated from this Overclockers forum post. It was originally posted by dribblesnort and written up for the frontpage by jhanby. Wow, nice work! Glad this was written up, very cool mod! very nice article !! nice to see all the work that went into this !! Nice review and great temps verses noise especially in HTPC, well done !